Stance Suspension is committed to improving handling dynamics of each vehicle they produce parts for. A well tuned suspension system and chassis is an integral component to an exhilarating driving experience, whether it be on the street or the racetrack. Stance analyzes the entire vehicle’s dynamics and tunes each component accordingly, from their complete coil over sets down to aluminum bushings. Stance realizes that a suspension system’s components must work together in harmony. A suspension system is only as good as its weakest link, therefore Stance tunes each part to maximize the chassis and handling dynamics. 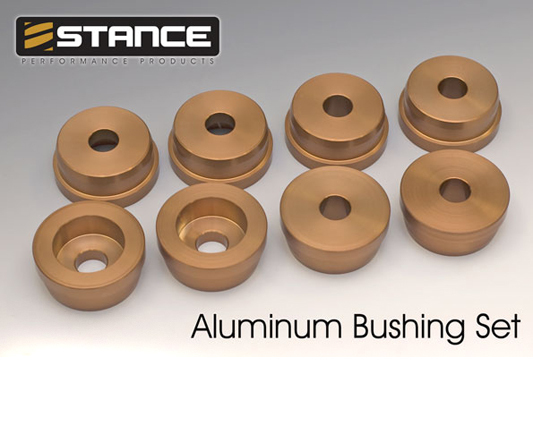 A vehicle uses hundreds of bushings throughout its construction to compensate for movement, smooth operation, and improve ride quality. Over the years rubber components on a vehicle deteriorate, especially ones that are weight bearing or are subjected to torsion forces and flexing. Suspension feel is lost when road impurities are compensated by the sub frame instead of the dampers. One of the most overlooked modifications for the aging S-chassis is replacing worn sub frame bushings. A large amount of suspension dynamics is compromised when energy is transferred to the shifting sub frame instead of being directed towards the dampers. Replacing tired and old rubber bushings with these solid anodized aluminum bushings will result in better suspension feel and response that a driver yearns for.